Select a stock and start using the web app. To save your changes and watchlist, please register. We deliver actionable investment tools for serious investors. We supplement the short-term "noise" that dominates financial decision making, and focus on higher-quality analyses. The analyses utilize machine learning combined with heuristics (i.e., rules) developed from many years of industry experience. Our analyses are unique. 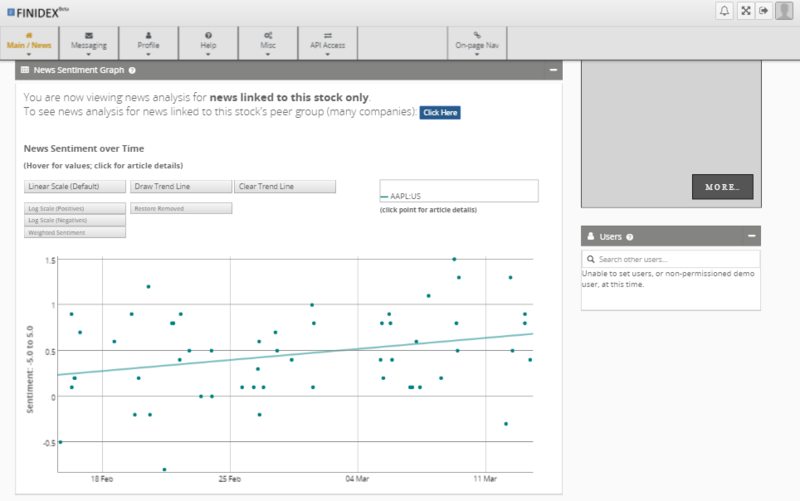 Users can review news analysis that is unbiased by a user's own pre-determined ideas or beliefs. To help our users make better investing decisions, we utilize methods supported by sound finance and economic theory. Regarding sharing: our platform supports collaboration, but we let users choose whether or not to collaborate through easy-to-find settings that turn on/off such functionality. Sharing only applies to, and is only available for, registered users – it isn't applicable or available to demo page users. Please feel free to contact us (below) if you have any questions about our methodology, the user interface, or anything else. We provide several help pages accessible from the application page menu and many explanations embedded in the application (question-clicks). FINIDEX makes available several thousand free demo pages. These can be customized (for the current session). For users who would like to save changes, and try all of FINIDEX functionality, registration is currently free. The Confidence of Relationship is a measure of how confident a user can feel about associations and relational choices within an analysis. It is displayed next to each group item and represents an aggregated statistic, across all users, of how confident you can feel for including a group item for a given reference item. FINIDEX allows sharing of investment frameworks, but not actual investment amounts. You get the full benefit of learning, but decision making remains PRIVATE. Users set their own permissioning levels. We offer comments, but comment-writers must be permissioned beforehand by FINIDEX so that comment writers are very knowledgeable, polite, helpful, constructive and write meaningful comments. You can set permissions to accept and/or display/share received comments. We provide you with an analysis of news based on your Groups and other factors, including an assessment of sentiment (positive, negative, neutral - with actual scores). 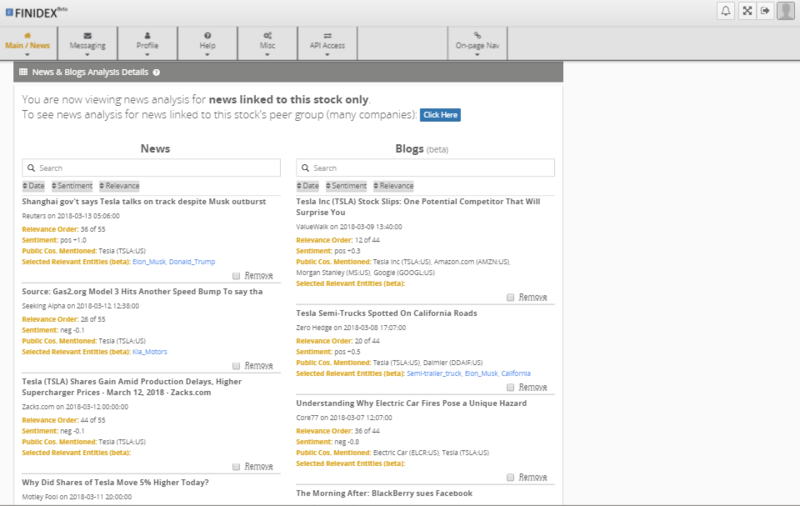 If you permission for sharing, then you can also observe another user's Group and their customized news analysis, giving you the ability to see news through another person's perspective for the same stock or theme. We provide you with prices (non-US equity prices are end-of-day currently), earnings estimates (US only currently), and access to some fundamentals (US only currently). 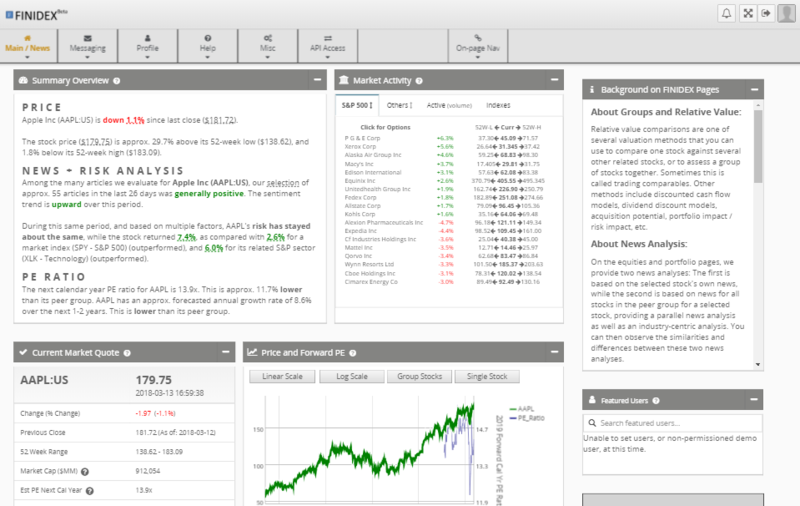 We provide benchmark indexes (US, other regions, by industry, etc.) for comparisons and portfolio functionality. 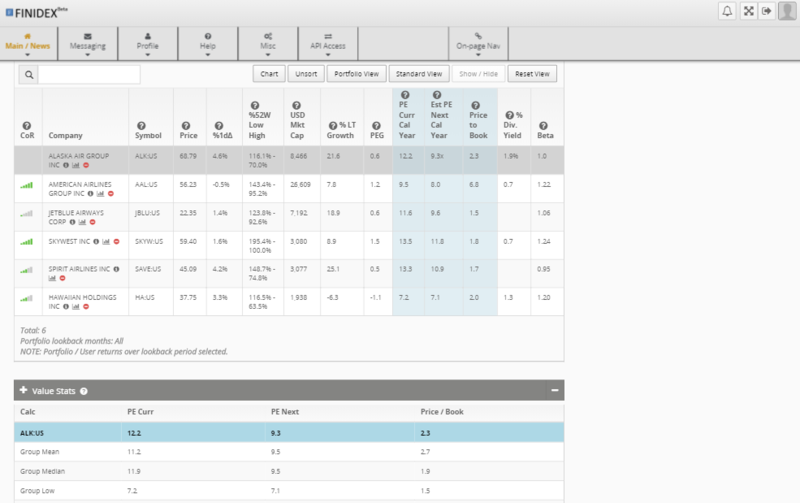 You can track an investment portfolio and include the portfolio items into your Equities Group, or into your Themes. This provides you with a link between your portfolio holdings and your Equities and Themes Groups. You can also share your portfolio page (not amounts/values, just positions and return percentages), depending on your permissioning choices. FINIDEX enables a learning feedback loop, whereby the interaction among a Community of Users improves the analysis. Users set their own permissioning levels for their sharing related choices. Through an API (only), FINIDEX may permission certain automated systems to participate just like a natural-person user. You choose, through your permission settings, whether to share / collaborate with automated systems (always clearly identified as such). We are in a 'beta' period. As we progress, our plans include enhancing the portfolio functionality, adding several charting tools, expanding data coverage (regions), advanced analytics, etc. Building a Community of Users. 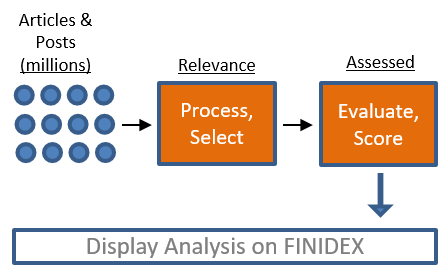 At FINIDEX, we believe there are benefits to setting-up an analysis with information from others. For our demo pages, we provide one such sample view. Once our community of users is in-place, you will have the option of collaboration with others. In the meantime, you can also utilize our demo pages (several thousand), which are free. So, for example, if you want to know which stocks to include in an investment theme (like "U.S. Economy Grows More than Expected in 2018"), you can use the framework "Themes". And, you can observe other users' group selections for that theme from those who have elected to share their frameworks. An example is which stocks to include in a peer group to determine relative value by using the framework "Equities". You can observe peer groups from other users who have shared their frameworks. Other frameworks are included, including "Strategies" (for example: Best Stocks to Own if Retiring in 5-Years), and more are planned. In each case, FINIDEX tells you how confident you can be when including an item into a group (for example, should a specific stock be included in the theme mentioned above). We do this based on an aggregated, anonymous assessment of all users' frameworks. This is called the Confidence of Relationship (CoR). Importantly, your investing decision-making remains private, while benefiting from understanding the other users' frameworks. FINIDEX also allows automated systems to participate, through a complete API, as a user on the platform, including posting comments, discussion items and setting-up a framework. Users can set their permissions to share/collaborate with such systems, or not, depending on their preferences. We believe that if FINIDEX provides value for you, then you should be willing to pay a fee. We currently provide a 30-day free period (during the beta launch, it is 90-days), and thereafter charge the subscription fees described below. Requires review of your qualifications. See here for details. Please use the form below to contact us. We will provide a timely response.